When you’re in the earliest stages of your customer experience (CX) journey, it can be hard to grasp the strategic value of CX. You may find yourself thinking: “Yes, I know customers are important. But do I really need a distinct program focused on customers?” It may seem simple to take a hands-on approach with customers at first. Still, you need to build your CX foundation, before growth brings new challenges and complexities. If you truly want to maintain a customer focus at every stage of your evolution, you should start putting foundational CX systems and processes in place early on. In fact, an article in the Harvard Business Review recommends that business founders start establishing some CX structure when they have less than five employees. Simple things, like routing incoming support requests to a central channel and creating a basic post-interaction survey, are important first CX steps for any business. Getting a solid CX foundation in place helps you prepare for increasing complexity as your business scales. Focusing on CX also allows you to stay attentive to the human side of business—and can drive revenue increases. These are two compelling reasons that validate that customer experience matters for every business. There is a human being on the other side of every business interaction. That is true whether those interactions occur online, over the phone, or face-to-face. You can anticipate that human being who is engaging with your business wants to have a pleasant encounter—not a difficult one. And the experience is particularly memorable—whether good or bad—human nature is to want to voice their feelings and share their experience. A CX initiative can ensure you never lose sight of this very fundamental truth. It’s easy for a business to become all about performance measures. CX itself is a very data-driven field, but also provides a path to understanding the human meaning behind the metrics. It can be enticing to look at an organization’s efforts through the lens of its technologies or processes, but those are just conduits to the ultimate objective: people. Since organizational success is driven by engaged employees and loyal customers, it’s important to focus on the underlying needs and behaviors of these human beings. If you don’t pay attention to the core needs and behaviors of your customers, you risk losing them. You could have the best products and most competitive prices, but you may still lose customers if you don’t make them feel valued. A widely-known study in the CX industry revealed that 68% of customers stop doing business with a company due to “perceived indifference.” That means customers leave when they feel a business doesn’t care about them. Looking more closely at these study results reveals an important point. Your customers are nearly five times more likely to defect due to the perception that you don’t care than because of service-related issues. In other words, you can deliver reasonable service but still risk losing customers if you don’t make them feel valued. By implementing CX fundamentals—such as requesting feedback—you can send the message that you do care about your customers. Better yet, you can act on relevant feedback and let your customers know that your making changes based on their insights. Customer experience is far more than a feel-good initiative. A well-executed CX program will also deliver measurable financial returns for your business. According to one study published in the Harvard Business Review, customers who rate their experiences with brands more favorably are likely to spend more. For transaction-based businesses, customers who had the best quality experiences spent 140% more than those who had the most disappointing experiences. . 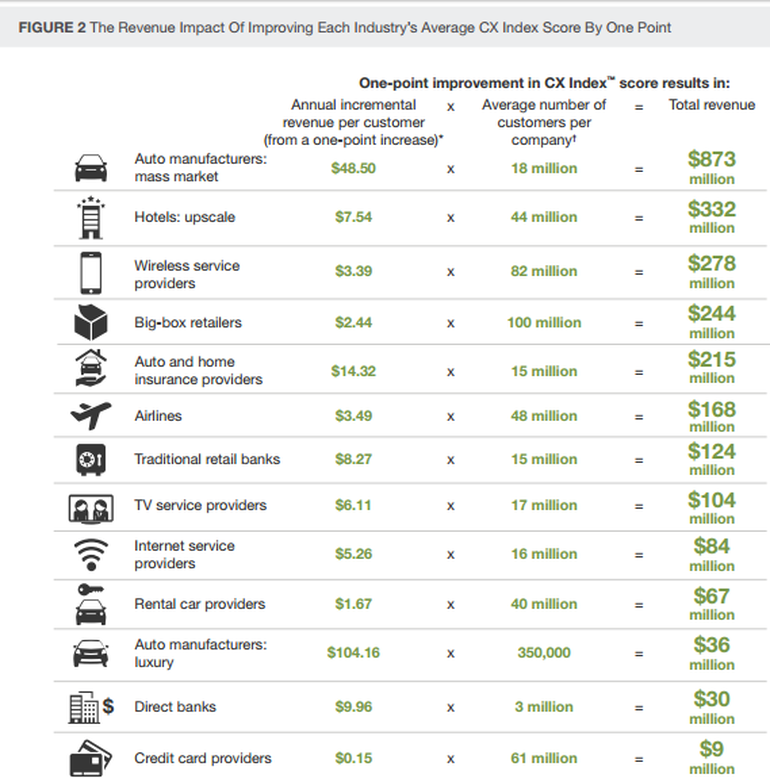 Recent research from Forrester reinforces the correlation between CX and revenue. The firm analyzed performance of organizations across multiple industries to create its Customer Experience Index (CX Index). Then, analysts calculated the per-customer revenue upside for companies if they improve their CX Index score by just one point. The potential is huge. Brands that can improve the customer journey see revenues increase as much as 10 to 15 percent while also lowering the cost to serve 15 to 20 percent. Although these truths are well established in the business community, most companies have a long way to go in CX. A 2018 study from New Voice Media revealed that poor customer experience is widespread and costly—while customers are gaining understanding of their true power. Poor experiences cost companies over $75 billion per year. And 67% of customers are “serial switchers,” who will stop doing business with a company after a poor service experience. While customer experience requires an investment of time and resources, the payoffs are clear. A company that focuses on CX can reassure customers that they truly care about them and appreciate their business. They can also earn customer trust—which can lead to loyalty and repeat purchases. Consider this fact: New Voice Media’s research found that 66% of customers would stay loyal to a company that provides good service, while 48% would spend more. Clearly, every business—of every size—is facing a choice. They can choose a customer-centric mindset or continue putting CX on the back burner. Those companies that take the path of CX excellence have an unprecedented opportunity to create positive experiences for customers and position themselves for long-term success.